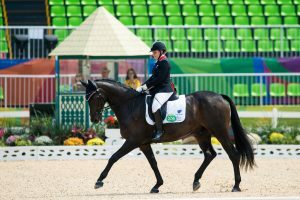 It was another brilliant day for the Great British para-equestrian dressage team, with four medals secured on day eight of the Rio Paralympic Games. Natasha Baker (Grade II) and Sophie Christiansen (Grade Ia) both defended their Paralympic titles from London 2012, whilst a British one-two in the Grade Ia, saw Anne Dunham clinch Silver. There was more delight to come for British supporters with confirmation that the team (Natasha Baker, Sophie Christiansen, Anne Dunham and Sophie Wells) had retained their Paralympic team title, remaining unbeaten in the event since the sport’s first outing at Atlanta in 1996. With today’s result secured, Great Britain remains undefeated at not only Paralympic level but also World and European. First up for Great Britain this morning was Natasha Baker who was looking to defend her Paralympic title from four years ago with Cabral, owned by Christian Landolt and her parents Phil and Lorraine Baker. 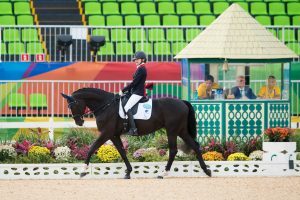 The only horse-rider combination in the para-equestrian dressage team from London, the dynamic duo gave it everything and produced a stunning test to see a score of 73.400% awarded. With the Gold going to Natasha, it was a double podium placing for The Netherlands, with Demi Vermeulen (Burberry) and Rixt Van Der Horst (Caraat) taking Individual Silver and Bronze respectively. The afternoon session at Deodoro brought about the final Individual Championship class as the Grade Ia athletes took to the arena. 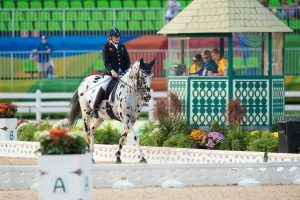 2012 Paralympic champion, Sophie Christiansen was first out for Great Britain with the nine-year-old Athene Lindebjerg, owned by Di Redfern. Producing an awesome fluid test with the mare, with eights and nines awarded for the pair’s halt, paces and final centre line, Sophie was absolutely delighted as a score of 78.217% was given, shooting her into the lead. The last rider for the British squad and the penultimate rider for the class, Anne Dunham with The Lady Joseph Trust and Henrietta Cheetham’s striking Lucas Normark, looked confident as they entered the arena. With some lovely work shining through the judges gave a final total of 74.348%, which put Anne just behind Sophie. 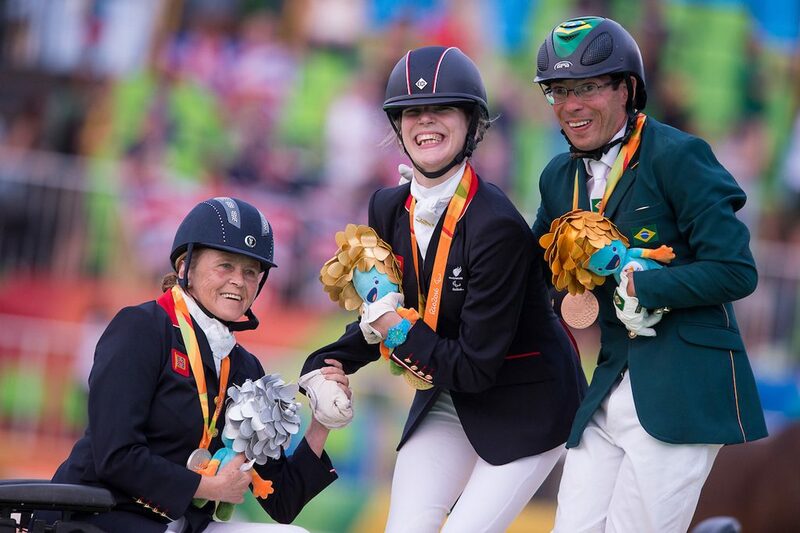 It was a nervous wait to hear the final confirmed scores, but the British equestrian camp had reason to celebrate as confirmation of a Great Britain one-two was announced, with Sophie taking the Gold and Anne the Silver, as the host’s Sergio Oliva (Coco Chanel) took the Bronze. The final day of the Individual Championship competition also brought about the finale of the team event. With some fantastic performances from the quartet over the week, Great Britain retained their Team title, remaining undefeated at Paralympic, World and European championships. Germany finished second, with The Netherlands third; the medal presentation for the team event takes place tomorrow. All five British athletes will compete again tomorrow as the Individual Freestyle tests get underway, which determines the second set of individual medals. The Freestyle tests see athletes ride to music of their choosing, set to a floorplan of their design.